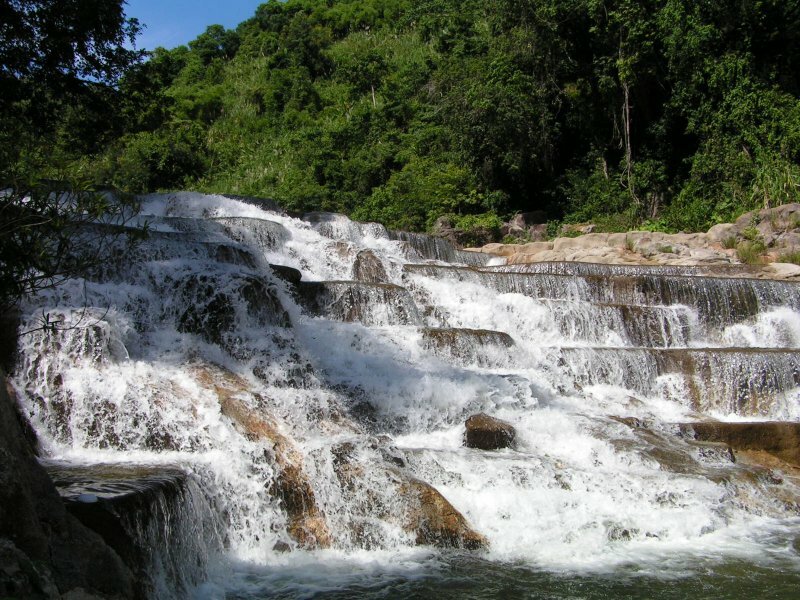 If there are Prenn, Cam Ly, Elephant, Datanla or Tiger Waterfalls in Da Lat which are so famous to most of tourists, there is another one in Nha Trang that is considered as one of the most beautiful waterfall in Vietnam coastal areas. There comes Yangbay Waterfall, an enormous and gorgeous site to visit when coming to Nha Trang. Approximately 45km from Nha trang, tourist can follow the narrow inter-district road and explore the beauty of local areas along the hillsides and slopes weaving between the rich rice fields. Located in Khanh Hoa Province, in an altitude of 100 meters from the sea, sea, Yangbay is covered with fertile virgin forests and rugged mountains. It is in the whole structure of Yang Bay Park as well. In this place, visitors will be impressed by the fresh air and cool weather. Moreover, the talent hands of humans have cleverly rearranged the nature but remain the spectacular landscapes. From Yangkhang artificial waterfall to the natural lakes, visitors are delighted to play and immerse themselves in cool water. Thanks to the ingenious artisans, the water flowing down creates a deep sound and super bass throughout the day and night. To reach this site, it takes visitors 45 minutes by bus or in case they go by car, the time will be much shorter. Having to say, Yangbay Waterfall is one of the best place to family to relax and join some entertainment games in the weekend. 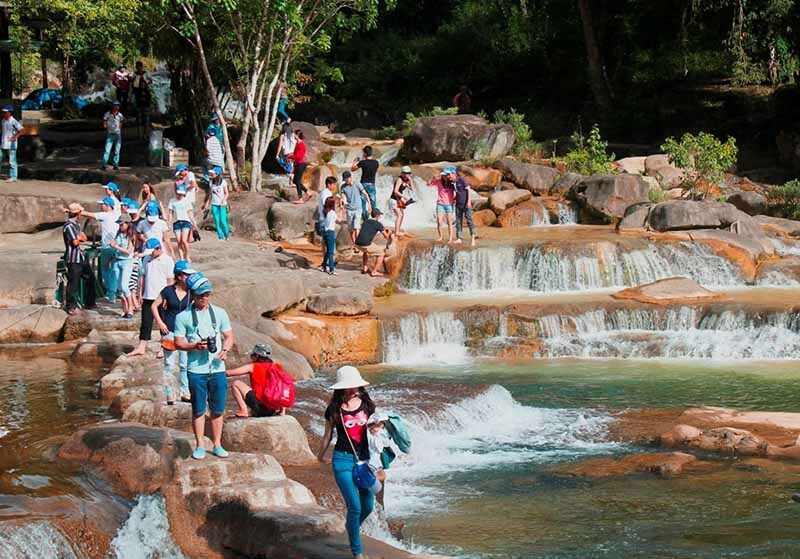 Coming to Yangbay waterfall, tourists visit “Moc Than” means “Saint Tree” of the Raglai (one of 54 races of Vietnamese) and have chance to enjoy Ethnic Music Show of the Raglai in Yangbay park. To strong people, they can find the source of the falls and conquer the primeval forests. Then, many beautiful sights are explored such as War Zones Cave H1, H2, Sung Sot interstice, etc. Moreover, visiting the ethnic villages will help tourists know more about the local people and their lives. Besides discovering the beauty of Yangbay waterfall, tourists can notice and join in some Vietnamese traditional games such as pig racing, javelin, crossbow shooting, feed for crocodile, feed for bear or The Raglai Show. After spend much time bathing and exploring the beauty of Yangbay, tourists have opportunity to experience the extremely attractive cuisines. The delicious food can satisfy even the most demanding customers with crocodile and ostrich meat, beef, etc. The mixture of local delicacies and precious ingredients creates the nutritious dishes that tourists cannot forget their flavor. After a comfortably relaxing day, nothing is wonderful than gathering around the fire and enjoy every specialties of Yangbay. The reason why Yangbay Waterfall become well known to people is to some extent because of the Yangbay Waterfall Legend Festival, a unique celebration and one of the largest festivals in Nha Trang held on July 20th. Generally, Yangbay Waterfall Festival is divided into two main parts: the ceremony and the festival. The ceremony will take place from 11 am to 12 am at Yangbay Waterfall stage, with the main content of the play named “Yangbay Legend”. The play will recreate a romantic love story of a Fairy, the daughter of the God, and a local man along. Through the play, professional actors will represent the fierce fight between human and cruel laws of the nature to protect life, thereby Yangbay Waterfall to be formed. It always have many reason why Nha Trang has become a wonderful and perfect place for travelers to set foot on and enjoy an amazing moment. And Yangbay Waterfall can be included in that list of explanation. With such a few words cannot fully describe the gigantic, powerful and incredible that place is. Tourists, therefore, are highly recommended to take a trip to this site and experience a good time deepening into the nature.